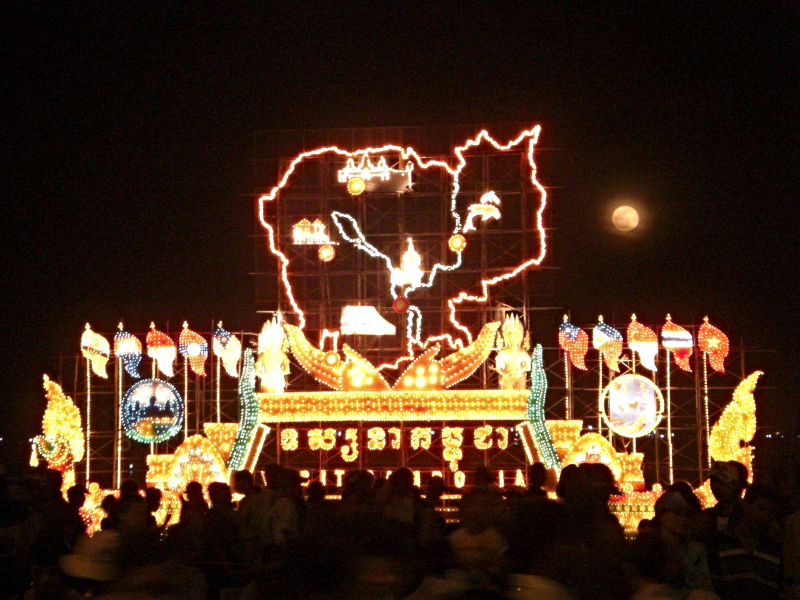 November is a very rich month with festivities in Cambodia. After Independence Day in early November, another one of the biggest local celebrations is coming soon! Actually starting tomorrow. It is called the Water Festival or “Bonn Om Touk”. It usually takes place during the full moon of November, which falls this year on 21-23 November. It is definitely one of the most spectacular of its kind in Southeast Asia. Find below all you want to know about this highly joyful festival. This Water festival has been celebrated in Cambodia since the 13th century. 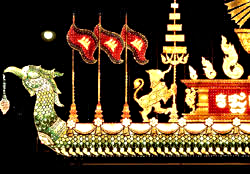 Originally, it is aimed at celebrating the end of the rainy season which often coincides with the reversal of the flow of Tonlé Sap River – that first began in June/July to go northwards with the start of the rainy season combined with the melting of the snow from Tibet -, and the resultant flooding of the Great Tonlé Sap lake upstream. This phenomenon is very unique in the world. During the wet season, the water level in the Mekong rises and the water flows upwards into the Great Tonlé Sap lake. It then turns into the biggest freshwater lake in Southeast Asia, increasing nearly 10 times its size. At the end of the rainy season in November, the tide is turning Southwards, emptying the Big lake and waters flow back toward the sea. On top of falling with the Full Moon which embodies the symbol of a bountiful harvest, Bonn Om Touk symbolizes the importance of the water as a life-giving resource: the lake being full is a source of fish abundance and a source of mineral abundance for the cultivated lands around. This annual festival is celebrated throughout the whole country with traditional dances, folk songs and festive gatherings everywhere. 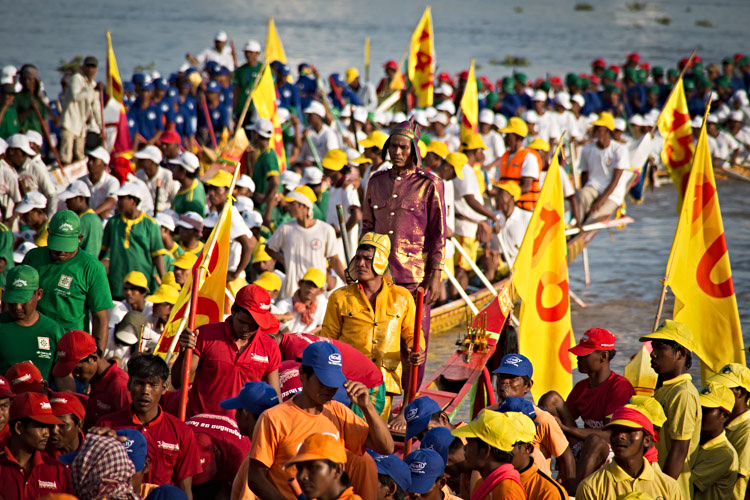 It is particularly popular & well known in Phnom Penh where it is celebrated with spectacular boat races on the Tonlé Sap river, with more than 300 long and colorful dragon boats, all coming down the river together and competing in a crazy parade in front of His Majesty the King. 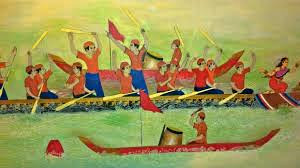 Those rowing regattas are said to commemorate the Khmer military victory in the 12th century over the Châme army. They are now a real impressive show for all locals and visitors, highlighting the expertise and speed of the rowers. Bonn Om Touk is a non-religious celebration but has a very special place in all Khmer people’s heart. It is a very joyful and a crazy time of the year with thousands of people from various provinces converging to Phnom Penh to watch the races on the river, eat traditional food, go to street concerts and have fun during the 3 full days of the Festival. After the Khmer New Year, it is the most important holiday time for Cambodians. 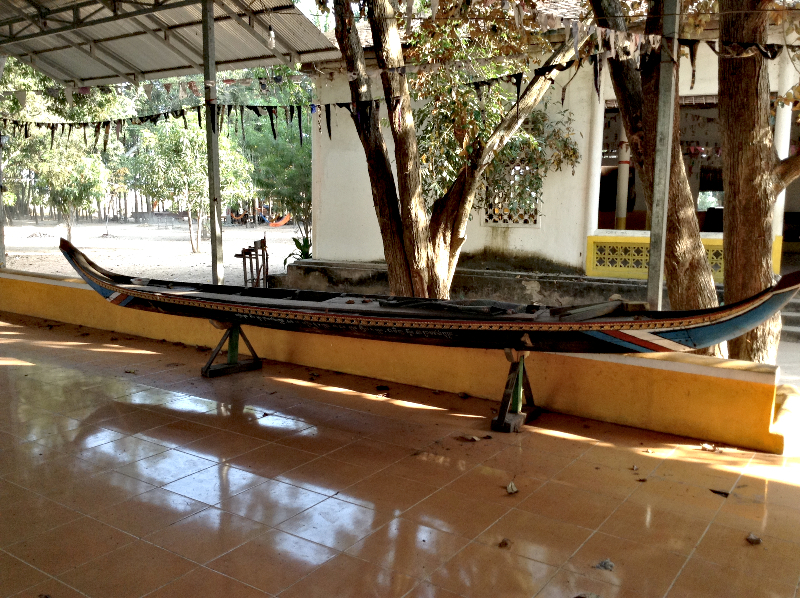 Do you know that each of the Wats in Phnom Penh and in the provinces has its own racing dragon boat? There is actually an elaborate ritual to “waken up the boat” after a year-long “sleep” and to “open their (removable) eyes” when they are placed again onto the prow of the regatta boat. 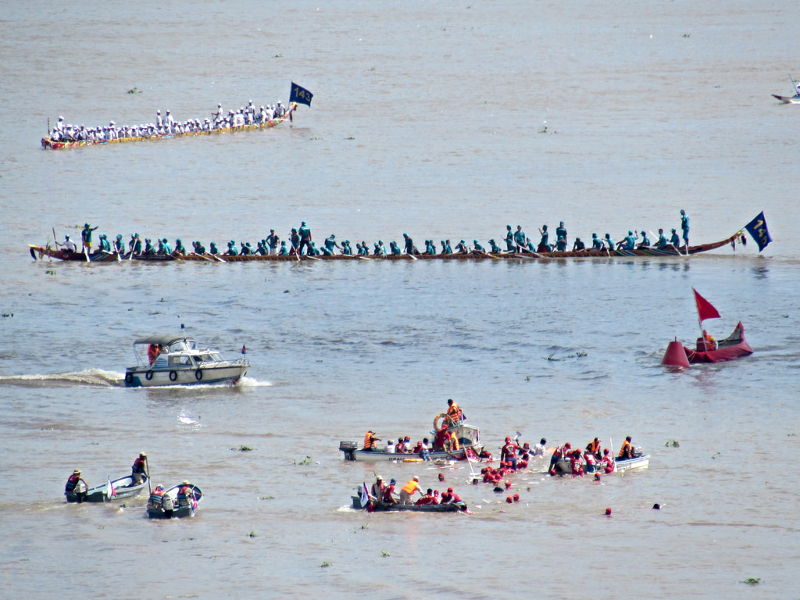 And when getting the boat to the Capital City, when the boat has to go under a bridge, the “eyes” are being removed from the prow, taken up on the shore to the other side of the bridge and then placed them back onto the boat, this to avoid bad luck during the race as people will be walking over the boat when they are crossing the bridge. Bonn Om Touk also intends to pay respect to the tutelary deities living under the waters – the Naga (mythical Serpent) – and also to demand Pardon to the waters that have been spoiled over the course of the past year. So if you are not afraid to tightly mingle with the crowds, you can join the gatherings on Sisowath Quay, you will probably have an unforgettable experience. If you are not in a jostling mood, then you should just find a good spot on a roof top along the riverside to watch the hectic festivities, the many illuminated floats with the logos of the highest institutions of the Kingdom (Royal Palace, Senate, National Assembly, various ministries,…) and marvel at the fireworks from a distance. On the last day of the festival, Khmer people would prepare offerings such as food, drink and incense in front of their home before gathering at temples later in the evening, in order to thank good spirits of the moon, the water and the land for providing life. Then, after the Sampeah Preah Khaè ceremony (Salutation to the Full Moon), they would eat traditional newly harvested fried rice (Aork Ambok) mixed with coconut and fresh banana, around midnight to end up with the celebration in a joyful mood. If you want to learn more about Phnom Penh’s best kept secrets, do not miss our walking tour in the Old District!